Julie Welles and Centalyon. Photos © Sportfot. Wellington, FL – January 14, 2017 – The atmosphere in the International Arena at the Palm Beach International Equestrian Center (PBIEC) was charged with excitement Saturday night, as the women took victory over the men in the $75,000 Battle of the Sexes, presented by Wellington Regional Medical Center, during week one of the 2017 Winter Equestrian Festival (WEF). Teams of ten men and ten women battled it out for this year’s Battle of the Sexes title, with team captains Nicole Bellissimo and Charlie Jayne at the helm. Bellissimo led Heather Caristo-Williams, Amanda Derbyshire, Abigail McArdle, Jessica Mendoza, Schuyler Riley, Haylie Rolfe, Mavis Spencer, Alexandra Welles, and Julie Welles on her team. Jayne’s team included David Blake, Daniel Bluman, Ernest Connell, Alex Granato, Darragh Kenny, Andy Kocher, Adam Prudent, Colin Syquia, and Hardin Towell. The contest was held in three phases, consisting of a faults converted speed round, a relay race, and a match race. The men and women were pitted against each other in each phase over courses set by 2016 Olympic course designer Guilherme Jorge (BRA). In round one, the men led the women seven to three in the speed rounds. In round two’s relay races, the girls picked up an additional ten points, while the men earned just five, bringing the totals to 12 for the men and 13 for the women. With one point separating them, the men and women headed into the third and final round for match races, where the women took a decisive 18 points to the men’s nine. The final tally of 21 to 31 gave the women the win. They have been victorious in the event eight out of nine years – with the class in 2015 ending in a tie. Julie Welles was representing the women for her first time in Battle of the Sexes competition and had a fantastic night with her mount Centalyon, owned by Ardencote Farm. The pair jumped fast and clear to help their team earns points in all three rounds. 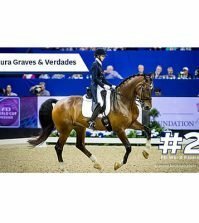 Welles is working for 2016 Olympic Champion Nick Skelton (GBR) and two-time Olympic team gold medalist Laura Kraut (USA) this year, and saw the night as a perfect opportunity to give her mount some experience in an electric atmosphere. Abigail McArdle was aboard Plain Bay Sales’ Comeback de la Manade for her second year competing in the Battle of the Sexes and also had a fun night representing the ladies for their win. “It was extremely thrilling,” McArdle declared. “The girls went in losing in the first round, and my only feat was to beat Andy Kocher. I didn’t think I could. Everyone told me I couldn’t, and then sure enough we did! I thought that was a good inspiration early on for the girls in the last round. 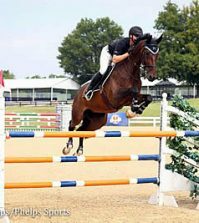 Also competing in the International Arena on Saturday, the $25,000 Suncast® 1.50m Championship Jumper Classic hosted its first event of the circuit, with a win for Wilhelm Genn (GER) aboard Eduardo Leon’s Bugatti. Twenty-four entries started over the first round track, with eight clear rounds, and four double clear. Genn and Bugatti clocked the winning time of 37.66 seconds. Jessica Mendoza (GBR) and Toy Boy finished second in 39.02 seconds. Andrew Welles (USA) rode Peter Welles’ Boo van het Kastanjehof to a third place finish in 39.81 seconds, and Jeffery Welles (USA) placed fourth in 41.19 seconds riding Herbert Sambol’s Broken Heart. The morning began with a win for Addison Gierkink and Kadley Holdings LLC’s Wisconsin III in the $15,000 Engel & Völkers SJHOF High Amateur-Owner Jumper Classic. 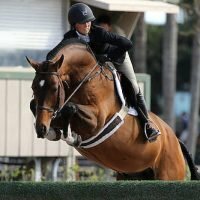 The $1,500 Sleepy P Ranch High Junior Jumper speed class was next to go with a win for Catalina Peralta riding Wendy Peralta’s Conti. 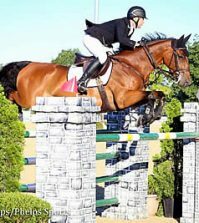 The $1,500 Hollow Creek Farm Medium Junior Jumpers also competed in their speed class for week one, which saw a win for Isabella Russekoff aboard Lexus Arbuckle’s Castor van de Krananburg. 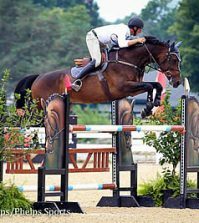 The Small Junior Hunter 16-17 division finished Saturday morning with Taylor St. Jacques of Glen Allen, VA, winning the championship aboard Rose Hill Farm’s William Hill. The pair received first place in the handy and the stake, second and third over fences, and third under saddle. Emma Kurtz took reserve honors aboard Rivers Edge’s Wisdom, placing first under saddle, and first, second, second, and fourth over fences. Both riders earned the same number of points in the division; however, because St. Jacques had more points in the over fences portion, she was crowned champion. William Hill is a six-year-old gelding by Coronas. St. Jacques showed the horse once last summer and then throughout indoors, where the pair won several classes. 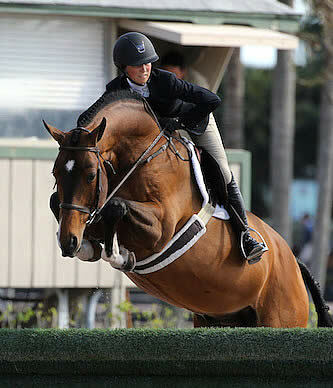 “I’m very fortunate and thankful to the Hymowitz family for allowing me to ride him,” she said. Scott Stewart also showed the gelding earlier this week in the Equine Tack & Nutritionals Green Hunter 3’9″ division and received ribbons in each class. 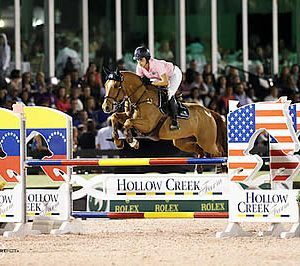 The first week of WEF concludes on Sunday with the $75,000 Rosenbaum Mollengarden PLLC Grand Prix in the International Arena. The FarmVet Adult Amateur Hunter 50+ Sec. B will award championship and reserve honors in the E. R. Mische Grand Hunter Ring. For full results, please visit www.PBIEC.com.